restaurant development + design is a user-driven resource for restaurant professionals charged with building new locations and remodeling existing units. 5 4 • S P O N S O R E D C O N T E N T • N O V E M B E R / D E C E M B E R 2 0 1 5 What would we be surprised to know about your company? VGS / Studio D provides a complete FF&G program (furniture, fxtures and graph- ics) — a turnkey solution for clients across North America. We are also experts in the science of selling food. From establishing the brand and food offering, to design, fabrication and install, clients appreciate our value as a sin- gle-source provider (in terms of time-savings, accuracy and cost effciencies). We are strategically aligned to solve problems with our clients, rather than for them. We scale and support our clients' needs not just as a supplier, but as a partner. What new trends do you see on the horizon for 2016? How might these trends infuence your fu- ture product development? Customers increasingly want choices. Their choices. And they have become more discerning with their time and their money. We are noticing that giving them ordering options (online, pre-ordering apps, kiosks, POS, etc. ), as well as how they can receive their food (pick-up, drive-thru, seated or delivered) are strategies that both increase brand affnity and create loyal customers. How are you working with designers or restaurant concepts to customize a unique solution? 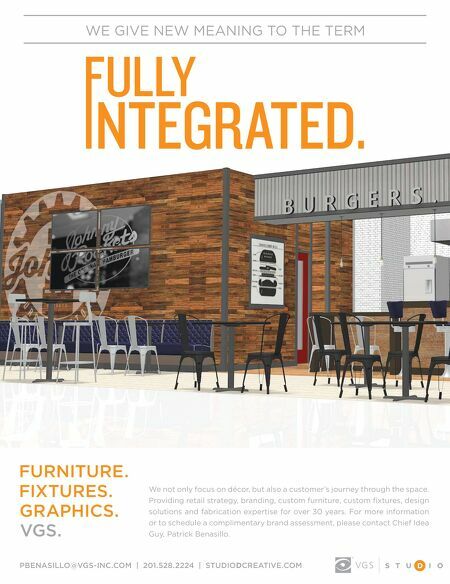 We are retail strategists and designers, as well as fabricators. Our success has come from supporting our clients and their teams to dive deep into their brand and customer experience; thus, helping to hone their offer and differentiate them from competitors. We often innovate with our clients through the creation of full- scale mock-ups of new store concepts, testing operations, customer path, and brand elements before building and scaling their store builds. Are you able to serve the larger scale requirements associated with a chain redesign rollout or a new concept design? Indeed. Our capability to de- sign and engineer everything from custom one-off solu- tions, as well as large scale roll-outs, means we have a unique offering in the market. We take the time to do the up-front work with our cli- ents, establishing core brand and décor elements before scaling to a larger roll-out or redesign. We help clients anticipate format and scale challenges that can impact all elements of the customer experi- ence; thus, creating a consistent on-brand experience, regard- less of the location. What role do you see design playing in restaurants today? Design today is more than aesthetics. Successful design considers all aspects of the customer experience. We consider what context is important for that customer in that location, while also remaining on-brand. VGS / Studio D not only focuses on the décor, but also the customer journey through the space. With today's demanding customers, décor design must consider all elements that create mood and theater to enhance the experience. This is where the senses are important: light- ing, sight-lines, acoustics and even smells. When these are considered, you will not only have an aesthetically pleasing store, but you will retain the customer with an engaging, distinctive and pleasurable experience. 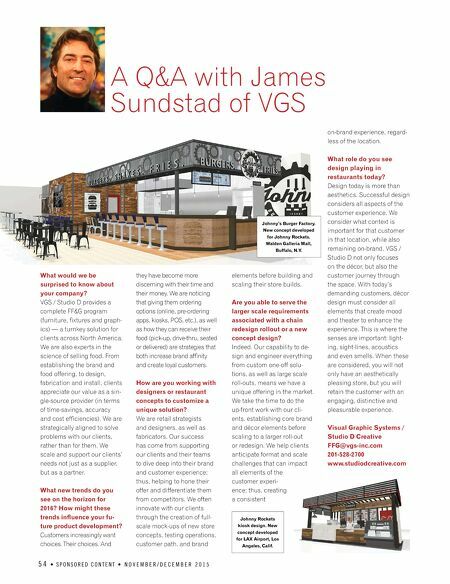 Visual Graphic Systems / Studio D Creative FFG@vgs-inc.com 201-528-2700 www.studiodcreative.com A Q&A with James Sundstad of VGS Johnny's Burger Factory. New concept developed for Johnny Rockets. Walden Galleria Mall, Buffalo, N.Y. Johnny Rockets kiosk design. New concept developed for LAX Airport, Los Angeles, Calif. Publisher's Letter: Until We Meet Again . . .